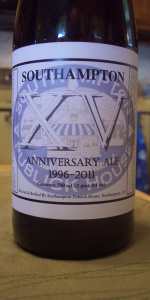 "Southamptom 15th Anniverary Ale is an amalgamation of brewing techniques and ingredients from Britain, German, Scotland, The United States, Belgium and France. We call it a blond Old Ale made with Golden Promise, French, German and North American malts, Belgian candy sugar and 3 German hops. Cheers to innovation!" Brewed in the style of an Old Ale, available in 750ml. bottles. Poured from a 750 ml. bottle to a snifter glass. Bottle poured into a snifter. 3.25 A: Murky copper color. One finger of frothy beige head. Retention is a touch below average and no lacing is left. 4.25 S: Biscuity with a rich cookie dough sweetness. A bit grainy underneath. Peach, apricot, and persimmon fruitiness. Caramel and toffee to round it out. Very mellow with sophistication. 4.25 T: Tastes like it smells. Big biscuit flavor with a chewy sweet breadiness. Rich toffee with a subtle caramel. Fruits as mentioned above. 4.5 M: For a brew with some age, the carbonation has remained perfect. Rich velvety body with good moderate carbonation. Pleasantly chewy. 4.5 D: Excellent brew. I'm pretty sure I had this fresh and I don't remember being as impressed as I am now. Drink it now if you got it. Bottle picked up at the release a few years ago. Wasn't wild about it release day but some time has passed so let's check in. Enjoyed from the snifter commemorating the event. a - brew pours a murky copper with a finger of frothy bubbly head that had nice staying power. s - nose opens with a sweet floral soggy biscuit. Sweet alcohol toastiness comes across as Belgian pale. t/m/o - about fifteen flavors crush through my palate at once...flowers, biscuits, toffee, Belgian sugar, toasted alcohol with a bitter dry finish. A bit fizzy. Medium bodied with a bitterness to it. Grew on me as I drank it but fairly sweet in general and more of a Belgian than an old ale. I think that this beer is in a better place than it was at the release but it is not worth chasing down. Pours a golden straw in color to a very light mahogany brown w/ a 11/2 finger off white head and heavy lacing. Aromas of mineral, biscuit, light citrus, and mild caramel/toffee. The flavor was big mineral almost saltiness up front, leading into biscuit and caramel/toffee. Medium bodied and lush. Grows on you as you sip. Overall, this was one of the more interesting brews I have encountered as of late. The brew almost reminds me of an Imperial Gose (if there is such a thing) w/ the saltiness up front. I can see how the demand is not very high for this brew, but it grew on me as I drank it. Simply seems mislabeled as an Old Ale. Pours a hazy amber color with an off-white head. Quite a sweet nose to this, very heavy on the brown sugar and caramel aromas. A light citrus characteristic along with some yeast and bubblegum? Strange. The flavor is very sweet as well. Sugar, brown sugar, and caramel along with a bit of toasted bread. A hint of the same yeast and bubblegum combination with a touch of spice. Really not sure what is going on here. Pours deep gold with a very nice looking fluffy white head. Smells like fresh biscuits baking with some clove and bananna. Taste is like a saison on streoids bready malt up front and a slight alcohol burn that fades to a very nice smooth fruity dry saison finish. Mouthfeel is pretty thick and carbonation is quite high. Overall really good beer as long as you don't try to fit it into any catagory...I remember having this at the release and not thinking too highly of it but 6 months later this beer is pretty amazing. An initially surprisingly light, golden color with a large white head that doesn't last for long and eventually leaves spots of lace down the glass. Unexciting, though appropriate enough. Toasted biscuit and simple grain constitute the majority of the aroma, along with some alcohol warmth, very mild citrus, and grass. This is lacking the typical sweet, bready, caramel, and toffee notes I found in anything labeled an old ale. Lots of biscuit and simple grain, with very mild earthy hops, very mild citrus, and some alcohol. Simple and straightforward. This lacks complexity and depth, and I don't think age would have done anything for this. This tastes like an imperial pilsner brewed with ale yeast. Medium bodied with high carbonation. A really simple, big, boring, though well crafted beer.